I'm trying to write about this, but I keep seeing films that I haven't watched yet and am getting lost in the joy and excitement of it all. There was a launch event at the BFI Southbank last night and we got to see four films on the big screen of NFT1. I'm enormously proud of what Sam, Sarah and Harry have done to get this project this far. They've gone far beyond my expectations in a very short time. It started in one of the conversations we did with Counterpoint and British Council folk all the way back in the summer of 2009, when we were trying to find social objects through which the council could engage digitally, someone from the Council said "Well we've got those old films in the archive…" and we pounced. Al Robertson and I had the great pleasure of sitting and watching a large number of the films directly on the gorgeous Steenbeck machines of the BFI and Al went and scoured the National Archives and wrote some lovely blog posts about it. 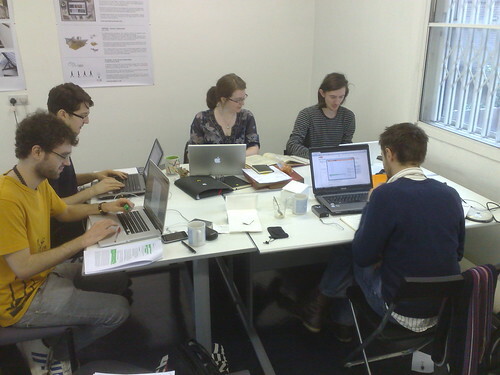 There was a brief hiatus until Catherine Fieschi brokered a conversation with Martin Bright to get New Deal of the Mind in to form a team of young, unemployed graduates to work on getting the archive digitised and online for a wider audience. Quite early on, they managed the coup of getting Google involved in funding the digitisation process. I very much enjoyed running an Action Learning Set for the team, getting them together every month at the Centre for Creative Collaboration to discuss what they were learning from working together and from working with large, well-established organisations like the Council, the BFI, Google and New Deal of the Mind. Brian Condon and I were really pleased when they said that they'd like to come and carry out their work at the Centre and I was thrilled when, after our final Action Learning Set meeting, Sam and Sarah told me that they were going to create a company to carry on with the work and to branch out into helping other archive owners. To me, Time/Image is one of the big stars of the Centre – I think they demonstrate the best of what we've achieved over the last couple of years, quietly getting on with it, playing a full role in the life of the building *and* creating bloody good work, resulting in something that I had great doubts could really be achieved given the political complexities of the organisations involved – I'm particularly impressed that the films in the collection are released under a Creative Commons Licence, which means that you (yes *you*) can download the films and re-use or re-mix them however you like as long as you fully attribute the source as the British Council Film Collection, you don't make commercial use of the film and you release any new works under the same licence. I was encouraged last night by seeing that Briony Hanson the (relatively) new Director of Film at the BC seems to have fallen in love with the collection as whole-heartedly as I have. Look out for some creative ideas around re-use of the archive later this year. And if you'd like a pop-up cinema presentation of any of the films, just give me a shout and I'll happily come and show them in your village hall/community centre/front room.